Extensive trials throughout the 2018 growing season have shown that PolyNPlus, BFS's revolutionary new foliar nitrogen range, is an effective replacement for soil-applied nitrogen during the later stages of the growing season. When PolyNPlus is used in a co-ordinated programme with soil-applied nitrogen, high yields can be achieved with less nitrogen. At the same time, PolyNPlus provides a breakthrough solution to the serious problem of agricultural pollution which water companies and the government are pressing the industry to tackle. Independent on-farm testing has clearly demonstrated PolyNPlus to be a virtually 100% efficient form of foliar nitrogen because it is effectively absorbed by the crop, allowing nitrogen to be translocated to the grain and improving yield. The latest trials, designed to ascertain how PolyNPlus can be used to achieve much greater nutrient efficiency, have also underlined the product's important environmental benefits. 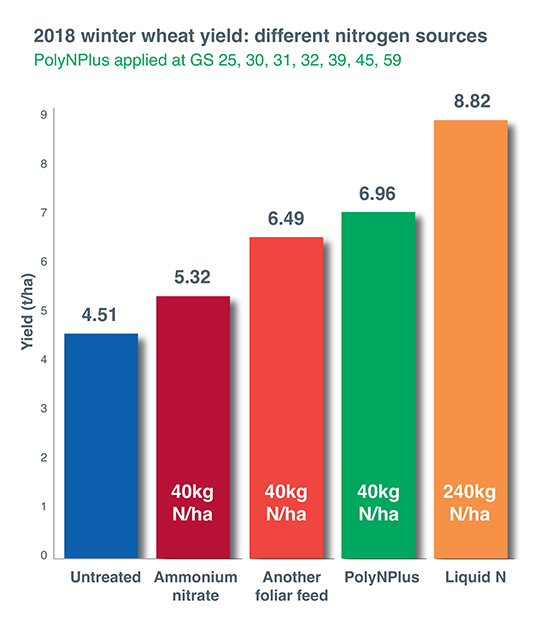 PolyNPlus significantly reduces the loss of ammonia to the atmosphere and nitrate leaching into water courses. Crucially, because PolyNPlus can be tank-mixed safely with many crop protection products, the number of passes that farmers need to make through a crop can be reduced. Other advantages over soil-applied liquid nitrogen products include a much lower risk of scorch due to the product's low salt index. This means that PolyNPlus is safe to apply later in the growing season, assuming normal precautions are observed. Rosalind Platt, managing director at BFS Fertiliser Services, said: "The trial results show that, with PolyNPlus, farmers can use less soil-applied nitrogen as well as gaining environmental benefits. Uniquely, BFS are also able to tailor the product to add individual farmers' specific trace element requirements."